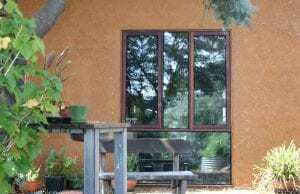 JOEL Meadows and Cath James wanted a sustainable rammed earth home but the more they explored this option the more their research led them back to the superior thermal properties of rendered straw bales. “Originally we were interested in rammed earth and we didn’t really like the aesthetics of the straw bale houses we had seen,” Joel said. 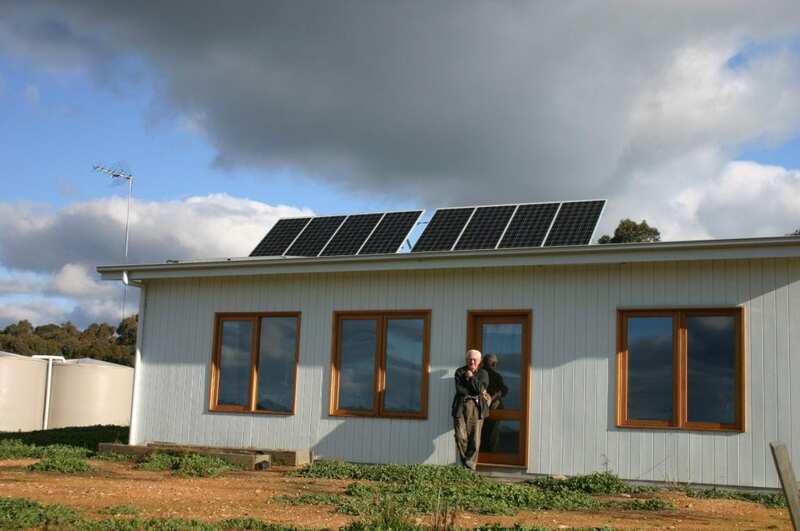 The family of four live in their straw bale house in the central Victorian regional town of Castlemaine they built over the last 2 years. The house was rated with an energy efficiency of 7.3 stars before other measures were added that would add to it sustainable qualities. The design incorporates 3 bedrooms, a music room, open plan kitchen with a meals/living area, a laundry/mudroom and dry composting toilet. 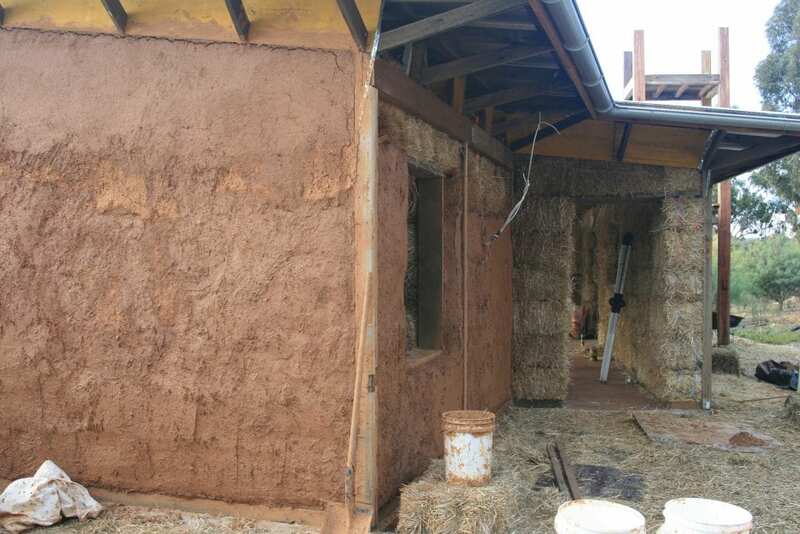 During the homes design and construction phases Joel learned many practical lessons about working with straw bales and clay render. He doesn’t subscribe to the concept that building a straw bale home can be efficiently achieved “in a day”. He believes if you get volunteers in to attempt a quick build you need many experienced straw bale builders to supervise. 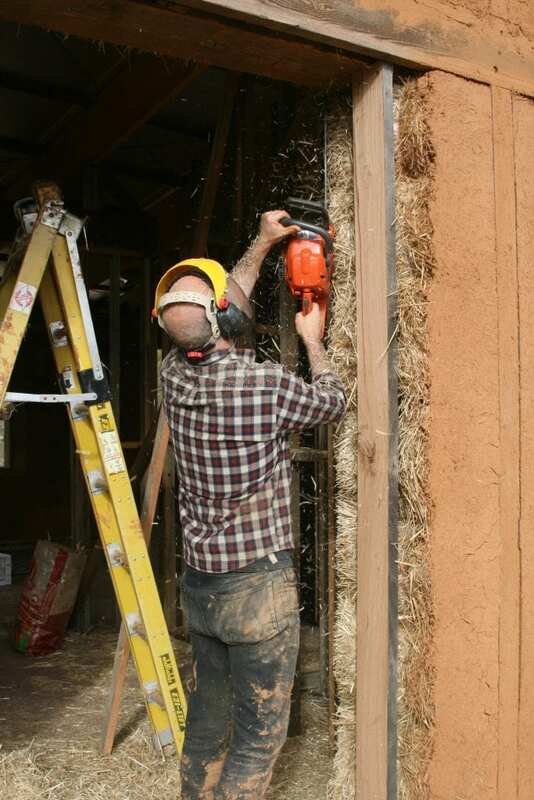 “Beware of the idea of building a straw bale house in a day,” Joel said. The straw bales in the Meadow’s external walls sit within the home’s timber frame pinned between a concrete slab floor and upper planks. Joel Meadows (right) positions straw bales with help from friends Sid Larwil (left) and Brad Welsh. 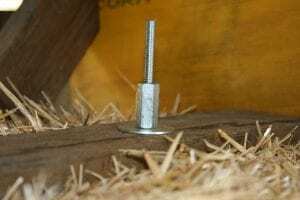 Lengths of threaded rods bolted into the concrete slab floor and joined together with barrel nuts are spiked through the bales until the rod is secured to a top plate (timber plank) to clamp the bales together. The straw bales are also interlocked in the wall to lend more stability. The external walls overlap the internal ceiling height to create a better ceiling to wall seal. 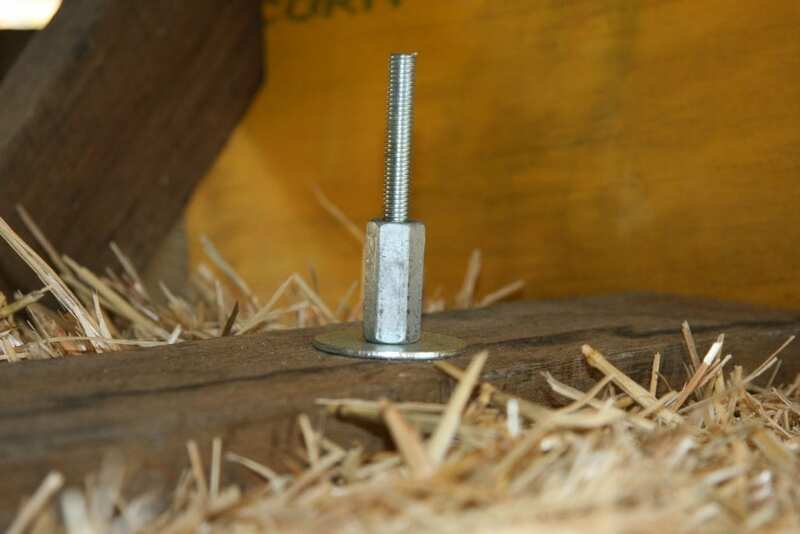 The top straw bale layer is clamped into position at eave height under a plank and later rendered to seal it. The house foundation is a reinforced steel mesh concrete slab floor with a band of extruded polystyrene run along its edge to insulate it from temperature fluctuations in the earth’s surface. Joel and Cath tried to keep the greenhouse emissions of building their home low, but after toying with the idea of a recycled crushed-concrete floor, or an earth floor, they decided a contemporary slab floor was their most suitable option. Recycled timber was used in the house frame with all the posts (vertical) structural timbers Victorian ash and most of the beams (horizontal) reclaimed oregon. Former power poles were milled and used in some exposed sections of the external walls as stout uprights. A large section of the northern face of the house is glazed. 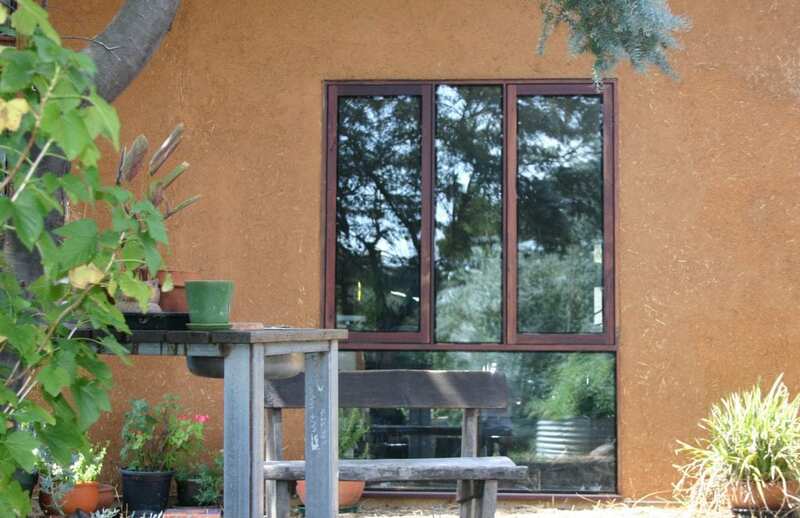 It consists of a series of recycled jarrah timber framed windows. Joel said he could not find an appropriate recycled alternative for the roof rafters so opted for a laminated veneer timber product used in many contemporary home designs. 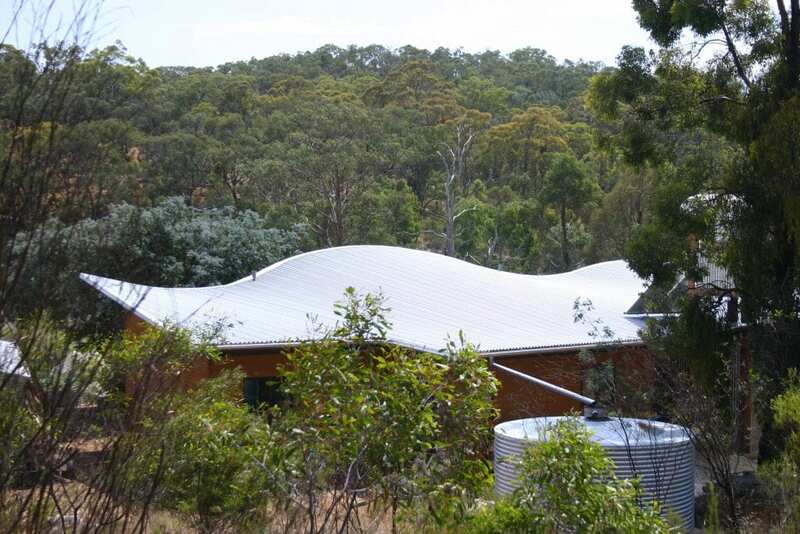 The roof consists of corrugated galvanised metal sheets and is a quirky undulating shape that mimics the contours of nearby hill ridgelines. The gutter is also galvanised iron. Laid across the rafters beneath the metal roof sheets is an Air Cell insulation blanket that consists of plastic bubble wrap sandwiched between sheets of foil. Joel said three coats of render were used to seal the external walls. The ingredients for the external wall’s rougher coats of render was mined from the actual house site while a product from a Bendigo firm called Claypro Australia formed the final finer render inside. Joel made sure he used a thick, gravel render mix to coat the very top bales at eave height, to fireproof them and to thwart rodents. He said with hindsight he wished he had spent more time using the chainsaw to get the external walls straight before rendering. This would have eliminated many low points that needed up to 40mms of render to achieve a suitable bushfire attack level (BAL) rating. After his experience Joel advises against using a petrol chainsaw to shape the bales due to noxious exhaust fumes and recommends an electric chainsaw. He has also heard of people using hedge trimmers and brush cutters. 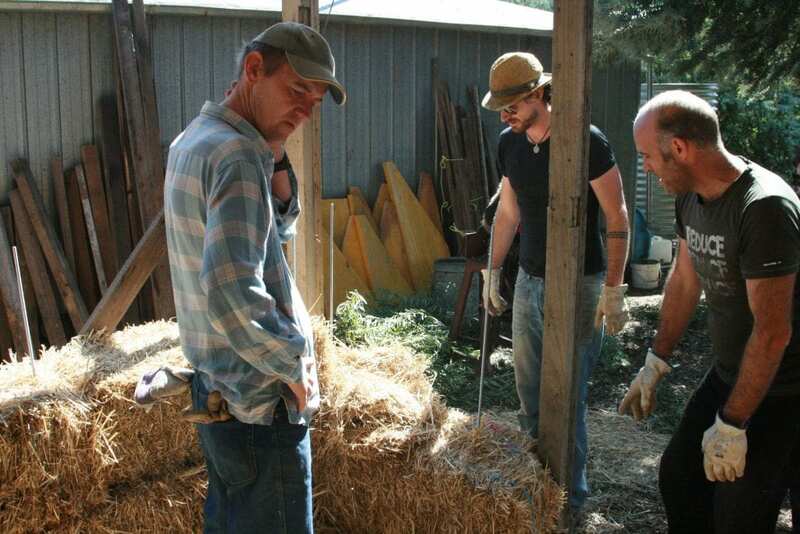 Joel Meadows shapes the straw bale walls of his Castlemaine house. He said if he had done more bale trimming he would have got a cleaner, compact surface that would have allowed stronger render adhesion. 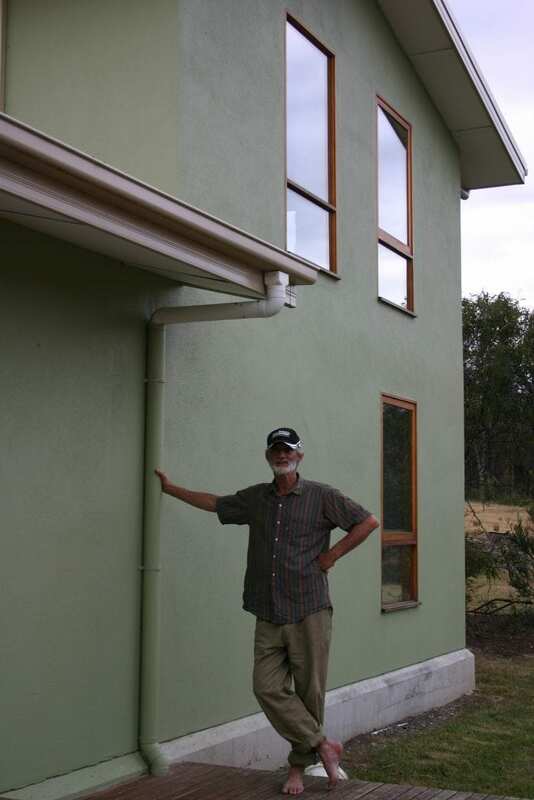 Joel is a creative handyman and a half, who has studied sustainable building methods including a TAFE college passive solar design course completed before he and Cath planned their straw bale home. Some of Joel’s practical inventions include a mechanical sieve to remove debris from the clay he used for the render. His external wall render mix includes loose straw. The first stage was a thicker mixture to help fill in the hollows and depressions. For the next two stages the render was prepared for a finer finish. Hands of family and friends generally sheathed in rubber gloves applied the render during a number of “working bees”. Joel said he found it was important the clay used for the render was allowed to fully absorb water prior to its use. “Soaking the clay is really important for at least a 12 to 24-hour period on the day preceding its use otherwise it doesn’t fully absorb the water,” Joel said. Joel’s render was mixed in 25 litre plastic buckets and an old bathtub using a plaster’s render mixer or a slow speed drill with a bakers dough hook attached. Joel realises the external walls will need maintenance with normal expansion and contraction, but one bonus effect of the clay render is that ultra violet light and normal weather shouldn’t affect it. He said the fibrous texture of his clay render has formed a crazed pattern that has acted to stop rivulets forming and prevent erosion during rain. Three coats of successively finer clay were used to render the straw bale house. To finish their home’s internal walls a mixture of loose straw combined with a clay slip solution was pushed into the wall cavities in between the wall studs. The face of the wall studs were sealed with a conventional render mesh stapled to the timber that was later covered with two coats of finer render. Before the internal walls were packed with the straw/slip mixture each stud cavity had appropriately sized timber boards secured both sides to sandwich the straw mixture while it was being tamped down. There were a number of concerns that Joel and Cath had to address before they decided to build a straw bale house including the fear about how straw bale homes would cope in a bushfire. The Meadow’s home has a BAL 29 rating. The Victorian Government’s Department of Planning, Transport and Local Infrastructure requires a minimum 12.5 BAL rating for all new houses built in a designated bushfire prone area. Joel said a straw bale is dense enough to retard ignition from direct flames and that rendered straw bale homes have been built that have attracted the highest BAL 40 and FZ ratings (flame zone) ratings. The majority of the straw bale home’s timber frame, including the jarrah windows, are recycled wood. Joel said once he had found his straw bale supplier he made sure he “butchered” a few random bales to satisfy himself they were good quality with no flaws. Joel’s experiences have taught him how to assess the quality of a straw bale to make sure it did not have too much internal moisture and to do this he used his nose. “We sourced our bales from a local farmer who had done a few bales for other people (who were building straw bales homes),” Joel said. “Modern bales have a shorter stem length than old wheat varieties, but we were happy with the bales we got. “You should get to know the quality of a good bale by its smell. You should smell the sweetness of the bale, not a mouldy smell.